Besides a rich supply of published works, genealogists can find a great many 17th and 18th century records online. State archives and libraries are some of the best sources. Following is a small sampling of helpful sources for finding online or published records about ancestors who lived in one of the “Thirteen Colonies”. While the colonies shared factors in common, the differing circumstances of their founding, natural geography, development, and government made each colony’s history (and their genealogical records) unique. A brief outline of each colony’s history is included to help make you aware of the dates and types of genealogical records you might find. Some online archives hold broad collections of records that include all of the original “Thirteen Colonies”. Google Books (www.books.google.com) and the Internet Archive (www.archive.org) have many searchable and downloadable versions of old public domain books. Their selections include many of the collections of colonial records mentioned elsewhere on this page, as well as militia records, land records, and published birth, marriage, and death records that go back to the colonial era. There are also numerous local and family histories with genealogical records and historical material on the colonial period. Material is more common for New England and the Middle Colonies than for the South, but all of the colonies are well-represented. One of your most useful stops on the web may be at the FamilySearch Wiki: http://familysearch.org/learn/wiki/en/United_States. You can find pages for each state outlining the types and dates of various genealogical records from that state, with tips on finding them. When available, there are links to digitized record collections elsewhere at FamilySearch. To supplement the outlines in the state pages, you can also check a list of categories at the left side of the page, such as probate, land, and tax records. Sometimes, there are separate listings of resources for certain record types for each state. The growing collection of online records at FamilySearch has a great deal of once hard-to-find colonial material. Their collection is growing fast and it’s well worth checking back frequently for new collections of vital records indexes, and microfilmed documents such as deeds, wills, and probate papers. There are at least some records for each state that go back before the Revolution; only the most detailed and notable ones are highlighted below. Also at FamilySearch, their library catalog (https://www.familysearch.org/catalog-search) contains many thousands of microfilmed books and records with information from the colonial period. These reels can be borrowed through their Family History Centers. Ancestry.com also has a very useful research “wiki” at http://www.ancestry.com/wiki/index.php?title=Main_Page. They offer a rich collection of genealogy research hints tailored to each colony’s unique history and records. Don’t overlook county government web sites: More and more counties have placed extensive collections of digitized deeds and other county records online. Usually, the online real estate records cover only a few recent decades, but there are growing numbers of counties that have some scanned records dating back before the Revolution. The Daughters of the American Revolution’s site at http://www.dar.org/library/ offers free online searching of the DAR Genealogical Research System at http://services.dar.org/public/dar_research/search. The system has basic information on thousands of Revolutionary War soldiers and patriots. Entries also include partial chains of descent for a few generations after the Revolution, offering a useful way to trace family lines back to people who were born in the colonial period. The US GenWeb Project at http://usgenweb.org has pages for U.S. states and counties that include some colonial-era genealogical information. Censusfinder.com has links to many online censuses, tax rolls, militia rolls, and similar lists dating back as far as the colonial period. The New England Historic Genealogical Society (http://web1.americanancestors.org/home.html) is the oldest genealogical society in the country. Some free databases may be searched at their web site, and paid membership includes access to nearly 3,000 online collections. The databases cover all of the New England states, and include some entries from regions of New York and eastern Canada. The English colony begun at Plymouth, and the Puritan settlements founded at Massachusetts Bay in 1630, were united with a 1691 charter. The 1691 charter also added modern-day Maine, as well as yet sparsely-populated areas of Nova Scotia and New Brunswick. As in all of the New England colonies, many colonial-era government (and genealogical) records were kept at a local level such as a village or town rather than at a county level. The Massachusetts Vital Records Project at http://ma-vitalrecords.org/ makes available birth, marriage, and death data ranging from the early 1600s to 1850. Entries are transcribed from Massachusetts town record books that were published in the late 19th and early 20th centuries. The ongoing project includes about three million records so far. The Massachusetts Archives Collection Database is available here: http://www.sec.state.ma.us/arc/arcsrch/RevolutionarySearchContects.html. The index contains names and abstracts drawn from Massachusetts documents dating from 1629-1799. A larger selection of the original microfilmed documents is available through the catalog of the Family History Library, as Massachusetts State Archives Collection, Colonial Period, 1622-1788 and Massachusetts State Archives Collection, Colonial and Post Colonial Period 1626-1806. Among the many Massachusetts volumes at the Internet Archive is the 12-volume set Records of the Plymouth Colony, in New England. Edited by Nathaniel B. Shurtleff and David Pulsifer, this work covering records from 1620-1692 first appeared in 1855-1861, and has been widely reprinted since. The Boston Tea Party Historical Society site at www.boston-teaparty.org/index.htmls has a partial list of participants in the Boston Tea Party. Although it began as a separate province in the early 1600s, Maine was later considered part of Massachusetts from 1677 until it was admitted to the Union as a state in 1820. For much of the colonial period, Maine’s only county was York County. County and town boundaries in Maine have been changed many times, adding some complications for genealogists. Maine’s first newspaper, the Falmouth Gazette, appeared after the Revolution, in 1785. For colonial-era Maine, newspapers of Boston and other towns elsewhere in New England may have useful information. The Maine State Archives (http://www.maine.gov/sos/arc) has helpful historical background information for genealogy, and some downloadable indexes including “Courts 1696-1854”. Although once part of New Netherland, Connecticut was founded predominantly by Puritan settlers who left Massachusetts in the 1630s. The Connecticut State Library has a useful guide to that state’s colonial census records at: www.cslib.org/colcens.htm#13. Among the library’s online offerings is the index to the large collection Connecticut Archives, 1629-1820 at http://www.cslib.org/ctarch.htm. Many of these volumes have been microfilmed and can be borrowed through the Family History Library or the Interlibrary Loan. Also from the Connecticut State Library are two later collections that may help colonial researchers. Aerial Photographs of Connecticut has thousands of images of aerial surveys made in 1934, 1938, and 1965. The WPA Architectural Survey, or “Census of Old Buildings in Connecticut, 1934-1937” contains descriptions of almost 5,000 old buildings (many with photographs) that were assembled by the Works Progress Administration. Both collections offer opportunities to find images of colonial-era homes, churches, or other structures once associated with Connecticut ancestors. The University Library of the University of Connecticut offers links to the Internet Archive’s copies of the 15-volume set Public Records of the Colony of Connecticut, 1636-1776 online at http://www.colonialct.uconn.edu. See also Lorraine Cook White, comp., Barbour Collection of Connecticut Town Vital Records (Baltimore: Genealogical Pub. Co., 1994-2002). Rhode Island was founded by religious dissenters from Massachusetts in 1636. Smallest of the Thirteen Colonies, Rhode Island was the last colony to become a state, as it did not ratify the Constitution until 1790. As with other New England colonies, many Rhode Island records were kept at a town rather than a county or colony-wide level. A major source for this state is James N. Arnold’s Vital Records of Rhode Island 1636-1850: a Family Register for the People 21 vols. (Providence, R.I.: Narragansett Historical, 1891-1912.) The volumes can be found online at the NEHGS, as well as Google Books and the Internet Archive. Useful books available at the Internet Archive include John Russell Bartlett, Records of the Colony of Rhode Island and Providence Plantations, 7 vols. (Providence, 1856-1862); Howard M. Chapin, Documentary History of Rhode Island 2 vols. (Providence, 1916); and Rhode Island Land Evidences 1648-1696, Volume 1 (Providence; R.I. Historical Society, 1921, 1970). English settlement began in the 1620s. For much of the 17th century, New Hampshire’s land was claimed by Massachusetts. From the end of the 1600s until 1741, the colonial governor of Massachusetts also served as governor of New Hampshire. 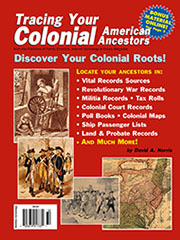 A useful outline with many helpful recommendations is the New Hampshire Genealogy & History page at Searchroots: http://www.nh.searchroots.com/index.html. Among the offerings of the New Hampshire State Archives is the 40-volume set State Papers of New Hampshire. The set, which contains many colonial-era records, can be viewed at: http://www.sos.nh.gov/archives/nhstatepapers.html. Although permanent English settlement began in 1724, Vermont was part of “the New Hampshire Grants”, lands in western New Hampshire that were disputed by the government of New York. During the Revolutionary War, in 1777, Vermont established itself as a separate entity. Vermont was admitted to the Union in 1791, as the fourteenth state, thereby becoming the first state to join the Union that was not one of the original “Thirteen Colonies”. Some records of colonial-era Vermont families may be found in New Hampshire sources. Delaware was part of the colony of New Sweden from 1638-1655, before coming under control of the Dutch government of New Netherland in 1655. England conquered the colony in 1664. Due to overlapping administrative boundaries or territorial claims, some of the colony’s early records are mixed with those of Pennsylvania, Maryland, or New York. Delaware became the first state to ratify the U.S. Constitution, in 1787. The Collections Gateway of the Public Archives of Delaware search page can be found at http://archives.delaware.gov/checklists. Indexed collections include the Orphans Court, probate, apprentice indentures, and coroner reports. Successful “hits” turn up index entries with limited information, and instructions on ordering copies of the originals. Records of the Court of New Castle on Delaware 1676–1681 (Lancaster, Pa., 1904); Craig W. Horle, ed., Records of the Courts of Sussex County, Delaware, 1677–1710, 2 vols. (Philadelphia, 1991); Leon deValinger Jr., ed., Court Records of Kent County, Delaware, 1680–1705 (Washington, D.C., 1959). Eventually coming under British rule, parts of New Jersey were once in New Sweden or New Netherland. Under English rule, the colony was for a time divided into East Jersey and West Jersey, and between 1702 and 1738 it was ruled by the governor of New York. Some early wills and other documents were therefore filed in New York rather than in New Jersey. Searchable databases from the New Jersey State Archives (http://www.nj.gov/state/archives/searchdatabases.html) include “Colonial Marriages 1665-1799”; “Proprietary Warrants and Surveys 1670-1727”, and “Supreme Court Case Files 1704-1844”. Index entries may have names, dates, places, or other information. Copies of documents referenced in a successful search may be ordered from the archives. A helpful source is Documents Relating to the Colonial History of New Jersey, 1st Series, 42 vols. (Newark, Paterson, and Trenton, 1880–1949), sometimes called the “New Jersey Archives”. Some of the earlier volumes are available online at such places as the Internet Archives, and they contain many early land records and other helpful genealogical information. Explorer Henry Hudson claimed New York for the Dutch in 1609. New York City was founded as the Dutch town of New Amsterdam in 1624, as the capital of the colony of New Netherland. The colony fell to the English in 1664, who renamed the town New York. Except for a brief re-conquest by the Netherlands a decade later, it remained in English hands. Many New York records were lost in a 1911 fire at the New York State Library. Fortunately, many historical and genealogical records were preserved in books published before the fire. The Internet Archive and Google Books are both rich sources for books with genealogical information on the colonial era. For example, Edmund Bailey O’Callaghan’s Documentary History of the State of New York (four vols., 1849-1851) contains tax and militia lists, as well as lists of inhabitants or freeholders of some 17th and 18th century towns. Also available is a good New York City resource: New York Historical Society, Tax Lists of the City of New York, December 1695 to July 15, 1699, in the series Collections of the New York Historical Society, Volume 43–44 (New York, New York: The New-York Historical Society, 1911–12.) These tax records note heads of households by ward, and give the assessed amounts of their property with occasional extra data. Helpful collections at Ancestry.com include “Landholders of Northeastern New York, 1739-1802”; “New York Wills, 1626-1836”; and “New York Colonial Muster Rolls, 1664-1775, Vol. I”. Part of Pennsylvania was settled by Dutch or Swedish colonists beginning in the 1630s. The English colony of Pennsylvania began with a 1681 royal grant to William Penn. The colony offered a home to Quakers, members of a religious sect who were persecuted in many places. The Quakers’ religious tolerance encouraged emigration, including a substantial influx of Germans as well as “Scotch-Irish” settlers from Northern Ireland who were of Scottish descent. Many settlers (such as the family of famed frontiersman Daniel Boone) later left the colony in search of land in the Southern colonies. Fold3.com offers free the Pennsylvania Archives set, a collection of documents dating from This set was originally transcribed from original documents mainly dating from 1664-1780 (some earlier records from the Swedish and Dutch colonies are also included) into a 138-volume set. Among the searchable documents is information about land, marriages, military records, and much more. Digital collections from the Pennsylvania Historical & Museum Commission include some indexes as well as scans of maps and documents, some of them dating to the colonial period. Their land records can be searched here: http://www.portal.state.pa.us/portal/server.pt/community/land_records/3184. Copies of documents found in the indexes can be ordered. Settled in 1634, Maryland was originally established as a colony for English Catholics. Large numbers of colonial-era settlers were indentured servants (many of whom were convicts) or slaves. The Maryland State Archives’ digital effort, the Archives of Maryland Online at http://aomol.net/html/index.html, lets you search for many thousands of colonial-era documents and records. Their collection makes available a truly spectacular amount of genealogical material including wills, probate documents, and estate inventories easily available. Maryland’s Revolutionary-era Council of Safety conducted a state census in 1776, to which the Maryland State Archives has an online index available at http://guide.mdsa.net/series.cfm?action=viewSeries&ID=S1419. European settlement began with the colony at Jamestown in 1607. As with neighboring Maryland, large numbers of colonial-era settlers were indentured servants or slaves. Virginia’s early counties were called shires. This state has a notable number of “burned counties” which have suffered considerable loss of old records through accidental or wartime courthouse fires. Several of the earliest counties have been abolished and merged into existing counties or cities. Virginia has a number of independent cities that are no longer a part of any county. A useful guide to the state’s “burned counties” and their records is provided by the Library of Virginia at http://www.lva.virginia.gov/public/guides/va22_burnedco.htm. At Virginia Memory, from the Library of Virginia at www.virginiamemory.com/collections, are several digital collections covering the colonial era. Thousands of images of 17th and 18th century land grants are in their collection “Virginia Land Office Patents and Grants/Northern Neck Land Surveys”. Several other digital collections include colonial documents, records, or maps. Some early Virginia settlers’ militia service is recorded at Virtual Jamestown’s searchable “Jamestown 1624/5 Musters” Database, online at www.virtualjamestown.org/Muster/muster24.html. Issues from three different newspapers, each called the Virginia Gazette, are available for searching at Virginia Gazette (1736-1780) at the Colonial Williamsburg Digital Library, at http://research.history.org/DigitalLibrary/BrowseVG.cfm. Other collections at http://research.history.org/DigitalLibrary.cfm include 17th and 18th century probate inventories from York County, Virginia. Periodicals with useful genealogical information include Tyler's Quarterly Historical and Genealogical Magazine (1919–1929); the Virginia Magazine of History and Biography, v. 1–38 (1893–1930); and the William and Mary Quarterly, series I and II (1892–1930). The first attempt at an English colony in the modern U.S. was made at Roanoke Island, North Carolina from 1584-1587. Known as “the Lost Colony”, the inhabitants vanished while the settlement was cut off from England during the attempted invasion by the Spanish Armada. Permanent settlement began around 1650, as Virginian colonists moved into the northern part of the future state. The 26-volume Colonial and State Records of North Carolina, originally published between 1886 and 1907, can be searched online at the University of North Carolina’s Documenting the American South site at http://docsouth.unc.edu/csr. Additional volumes of the Colonial Records of North Carolina have been published, containing records of colonial higher courts, the Executive Council, and the Church of England. The State Archives of North Carolina’s Manuscript and Archives Research System (MARS) at http://mars.archives.ncdcr.gov/BasicSearch.aspx contains index entries for land grants, wills, and other colonial-era documents. Copies of documents found on the system can be purchased. The North Carolina Newspaper Digitization Project at www.archives.ncdcr.gov/newspaper/index.html includes the state’s approximately 70 surviving issues of pre-Revolutionary papers. Permanent settlement began in with the founding of Charleston in 1670. Some early colonists were English planters from Barbados. A small but significant contingent of the early settlers were French Huguenots. A large portion of the population were slaves. South Carolina’s counties were replaced by newly drawn units called districts from 1769-1785. Anglican parishes were used as election districts, and handled some government functions. Prior to 1785, many records were filed centrally in Charleston rather than in counties or parishes. The South Carolina Department of Archives and History has their Online Index search page at http://www.archivesindex.sc.gov/. Names are indexed from some colonial-era areas such as land grants, court records, and wills. It’s possible to order copies of documents found in the index. A. S. Salley’s three-volume Warrants for Land in South Carolina 1672-1711. (Columbia, S.C.: Historical Commission of South Carolina, 1910-1911), is available online at the Internet Archives and elsewhere. “Youngest” of the “Thirteen Colonies”, Georgia’s English settlement dated from 1732. Georgia’s earliest existing counties were created in 1777, when the Revolutionary government divided the colony’s Anglican parishes into counties. The Georgia Archives’ “Georgia’s Virtual Vault” at http://cdm.sos.state.ga.us:8888 offers images and information online, notably wills of the colonial era. Their “Ad Hoc Collection” contains miscellaneous scanned items including some from the 1700s. Useful genealogical and historical material was published in The Colonial Records of the State of Georgia, a 26- volume set that was edited by Allen D. Chandler beginning in 1904. The Farber Gravestone Collection has photos of over 9,000 pre-1800 gravestones from the Northeastern U.S. at www.davidrumsey.com/blog/2007/9/1/farber-gravestonecollection. The Genealogy Inc. Web site at www.genealogyinc.com has links to each state, where you can find useful interactive maps of county boundary changes from the colonial period to the present. domestic/index.html includes over two million place names. Some alternate or archaic designations are included. Many colonial-era sites such as forts, ferries, churches, bridges, and fords can be found. Options allow you to pinpoint sites on a variety of contemporary maps and aerial or satellite views. The Newberry Library’s Atlas of Historical County Boundaries may be viewed at http://publications.newberry.org/ahcbp. The US Office of Coast Survey’s Historical Map & Chart Collection at http://historicalcharts.noaa.gov offers over 35,000 scanned maps and charts, over 100 of which predate the agency’s founding in 1807. This collection is particularly useful for maps of harbors, coasts, and navigable rivers. The Immigrant Servants Database, offered by Price and Associates at www.pricegen.com/immigrantservants/search/simple.php, has over 20,000 names in its growing collection. Old Bailey Online, at www.oldbaileyonline.org, has details of nearly 200,000 criminal trials dating from 1674 to 1913, which were held in London’s Central Criminal Court (known as “the Old Bailey”). Thousands of these cases have links to colonial America, mainly concerning convicts who were sentenced to indentured servitude. www.pierre-marteau.com/currency/converter.html provides equivalents between major world currencies of that time. To see what historic newspapers have been microfilmed, visit the U.S. Newspaper Project page at http://www.neh.gov/us-newspaper-program for links to state microfilming projects. Free online collections of colonial Virginia and North Carolina newspapers are mentioned with their respective states. Issues of Great Britain’s official newspaper, the London Gazette, dating back as far as the 1660s can be searched at www.london-gazette.co.uk. Some issues contain news of events in the North American colonies, as well as appointments of colonial or military officials. Fee-based web sites such as Genealogybank.com, Newspaperarchive.com, the Godfrey Memorial Library (www.godfrey.org) and Ancestry.com also offer collections that include 18th century newspapers. Newspaperarchive.com’s holdings include a large collection of 18th century English and Irish newspapers, which are worth checking for material related to the American colonies. Many local or university libraries subscribe to services offering digitized historic newspapers, such as Accessible Archives, or Readex’ Early American Newspapers, Series 1, 1690-1876. The National Archives (of Great Britain) has a helpful online tutorial, “Paleography”, at http://www.nationalarchives.gov.uk/palaeography.